A deck log from a ship that searched for bodies after the Titanic sank sold for more than $100,000 (euro74,000) as part of a Christie's auction of memorabilia from the doomed oceanliner. "It's a journal that documents how many bodies were picked up and where in the Titanic debris field in the Atlantic Ocean," said Gregg Dietrich, Christie's maritime and oceanliner specialist. The Titanic - the world's largest passenger steamship at the time - struck an iceberg in the Atlantic and sunk on its maiden voyage, killing at least 1,496 people April 15, 1912. All together, the 18 lots of Titanic memorabilia - including letters, postcards, telegrams from survivors and photographs of passengers - sold at auction Thursday for a total of $193,140 (euro143,417). The auction also included the ship's first-class passenger list, with such prominent New York names as the Astors, Guggenheims and Strauses. That sold for $48,000 (euro35,600), topping a pre-sale estimate of $15,000 to $20,000 (euro11,000 to euro15,000). An eight-page handwritten description of the sinking fetched $16,800 (euro12,500), exceeding the pre-sale estimate of $10,000 to $15,000 (euro7,000 to euro11,000). The original account was written by 16-year-old Laura Marie Cribb, of Newark, New Jersey, after surviving the wreck. A third-class passenger, she was rescued by the R.M.S. Carpathia, but her father perished. She watched the lights go out on the Titanic, followed by the "most terrible shrieks and groans from the helpless and doomed passengers who were left on the wreck of the great ship." The deck log from cable ship S.S. MacKay-Bennett, the second ship on the scene after the R.M.S. Carpathia, was up for auction at a pre-sale estimate of $30,000 to $50,000 (euro22,000 to euro37,000). The log sold for $102,000 (euro76,000). All prices include a 20 percent buyer's premium. The rescue ship S.S. MacKay-Bennett was the first of four vessels that searched for bodies after the Titanic, which carried more than 2,000 passengers. An embalmer from Nova Scotia was stationed onboard the MacKay-Bennett to oversee the operation. After seven days, 306 bodies were recovered. Artifacts from another famous shipwrecked luxury liner, the Andrea Doria, were also auctioned. The Italian vessel was heading across the Atlantic toward New York in 1956 when it collided with a Swedish passenger ship, the S.S. Stockholm, and sank, killing 46 people. 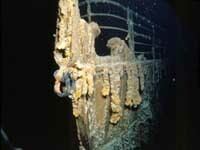 The wreck lies on the bottom of the ocean floor south of Nantucket, Massachusetts. Christie's also sold items like silverware and posters from the S.S. Normandy, the French Art Deco oceanliner that capsized and burned in New York Harbor during World War II.